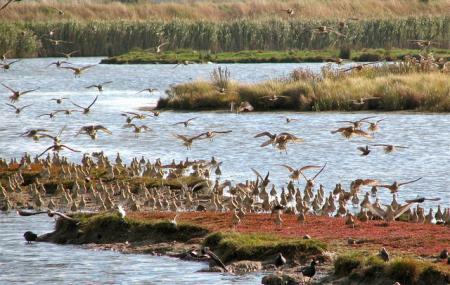 Find hotel near Oare Marshes Nature Reser .. The Oare Marshes is an important wetland reserve that is known especially as a site for a range of migratory bird species. The reserve encompasses more than 81 hectares of grazing marsh with seawall, freshwater dykes, saltmarsh and open water scrapes. The Reserve is of international importance for breeding and wintering wetland birds including several threatened species. Amongst the species that can be found here include Lapwing, Avocet, Black-tailed Godwit, Curlew, Shoveler, Whimbrel, Eurasian wigeon, hen harrier, Eurasian curlew, merlin, common tern and much more. There are several trails at the reserve that lead through the reserve and offer access to you to have a better opportunity of catching a few rare sightings. Great for bird watching and photography. Very peaceful and tranquil. You can walk and take the dog for walking along the estuary all the way up to London or down to Dover if you have the time!! An old fashioned nature reserve with basic facilities and plenty of wildlife to enjoy. Other than birds, it's a great site for dragonflies. We really enjoyed our visits here. Went here for a walk with my famil and what a fantastic place, fresh air, peaceful and lots of wildlife. Final piece of road to the car park is a bit rough but as long as you are careful it's not a problem. Their are no public toilets. Good place for bird watching. Small car park. No public toilets. Great place to view the River Swale. Popular with bird Watchers.